The Spikes Asia Festival of Creativity is back at Suntec City on 21st-23rd September 2016. This is one of the two major regional advertising shows for the advertising industry. AdFest was held at the beginning of the year and now our attention turns towards Spikes. While the conference is a draw to many, the creative teams await the results of from their entries to the creative competition. The judges are very important and most of us want to see the caliber of the judges selecting the work that goes on to win the top prizes. 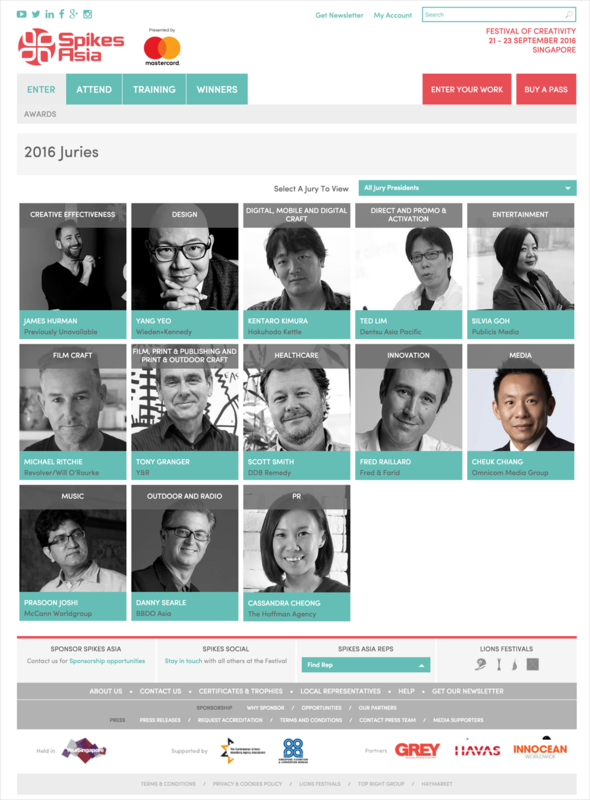 The organisers of Spikes Asia have released the full list of Juries which you can find on the website. For now, here are some of the Jury Presidents which will give you an idea of the calibre of the full Juries: Overseeing the ‘Film, Print & Publishing and Print & Outdoor Craft’ is Tony Granger. He is Global Chief Creative Officer, Y&R, Global. Yang Yeo, Executive Creative Director, Wieden+Kennedy, China is heading the ‘Design’ and ‘Direct and Promo & Activation’ is led by Ted Lim, Chief Creative Officer, Dentsu Asia Pacific, APAC. LATE NEWS: Due to a family illness, Danny Searle will replace Ali Shabaz, Chief Creative Officer at Grey Group, South East Asia as Jury President of the ‘Outdoor & Radio’. Searle is Vice Chairman & Chief Creative Officer, BBDO Asia, Asia Pacific.